West Palm Beach, FL – For boaters navigating to and from Lake Okeechobee, the South Florida Water Management District (SFWMD) will soon close several navigation locks on the north shore for safety reasons. 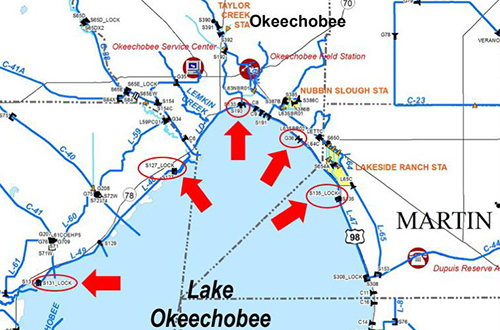 The closures are a result of persistent drier-than-average conditions that have reduced water levels in Lake Okeechobee. Injury and lock damage could occur when boats pass through these structures at water levels below any of the designated safety limits. Martin County: S-135 structure, J&S Fish Camp. Okeechobee County: G-36 structure, Henry Creek. Glades County: S-127 structure, Buckhead Ridge. Glades County: S-131 structure, Lakeport.